Possibly already been posted, idk. Recently came back a few days ago and noticed the Banker set in gacha and that it has been there for a lil while now. I haven't really checked the previous patch notes pages (to see if this has already been made known) but I really like to play gacha so I decided to spend a bit of my remaining gacha coins on it. Maybe I should've checked those patch notes. Oh well. After taking a good (and unfortunate) ~100 coins to complete the town, I went to check my goods. I noticed a small difference in it. I'm not sure if anyone noticed it in the time that it's been up and if this was already reported. But if it hasn't then... uhh. 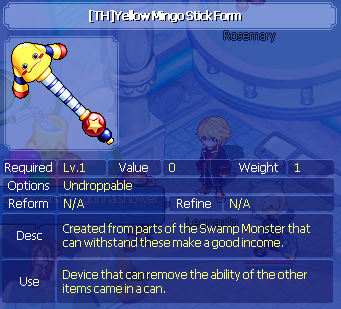 Not only is this a different item given from what's on the list, it seems the odds of getting it seems extremely low. Taking me a good ~100 gacha coins to get while getting many many multiples of every other item. 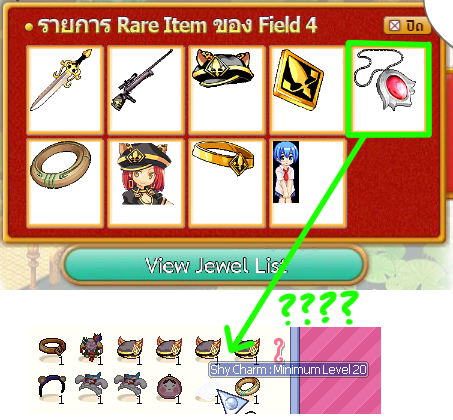 I had thought for a moment that maybe I had gotten this from something else and I was over thinking it but when I had gotten the red necklace, it was no where to be found in my ms inventory while this thing was there. 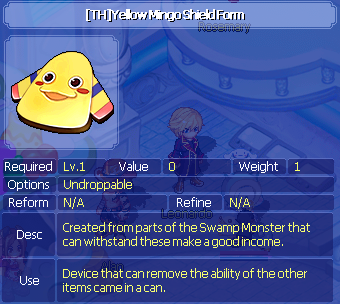 It seems to fit what was given since it is a "Shy" item, just like the pet in the last image. All my characters are in [ #]. I have a favor to ask. Can we have a shuffle on the CWB contents? I feel like we are a bit overdue on something like that. Also, seeing soil stones go almost over 10 million galders is bothering me a little bit. I was thinking you can give a soil stone after completing Pharaoh Boy's quest (by having all the golden weapons). That way, we have two ways of obtaining a soil stone instead of only one way. Thanks for the lovely update also! the CWB, please do list them. You got it. Just some suggestions here! Would be possible to have code exchange in Chaos Tower to have quantity that you can pick? I mean, just like compounder paul's where you can just add the amount and exchange once. The issue with that approach is that the compounding interface has an inherent failure chance that's always at least 5%. Would you rather collect those codes one-at-a-time with a 100% success rate, or all at once with a 95% success rate? It's most likely possible in code to set the inherent failure chance to 0%, in other words, a 100% success rate. Description: As of late many people on our server have began to take part in Harkon Defense (harkon defense is a Tower defense game you can participate in once you have become enlightened), but thanks to our ability to become super hax from the auction house capability's people have began to complain that killing chronos happens way to fast, and thus people don't get a chance at the boss or his shard drop. Suggestion 1: Triple the base (HP) hitpoints of Chronos in all three modes. There are three modes in Harkon Defense with there own Hp and Status bars. If the HP is raised by x3 in theory it should make it easier for more people to get a hit on the boss. ATTENTION: Hitting the boss does not guarantee a drop, but maybe with more hp we will see more people receiving Chronos shards. Here is another option to go along with suggestion 1. When the team is successful in harkon defense a box will spawn in each players inventory for everyone in the shadow sanctuary. These are just some suggestions I wanted to throw out there. I hope this is legible and easy to understand! Some of the descriptions for the JP pets (mostly the Harkon ones) bothered me, so I hope I'm doing this "old to new" thing right. Desc: Pet the image of Hecate, one of the boss led by a legion of darkness. There is no danger, it is possible promenade with confidence. I can get with a coin shop in Halcon patron warfare in the waiting room --> The chibi version of Hecate, one of the monsters led by a legion of darkness. Obtainable from exchanging Hecate shards and the set with Stella in Megalopolis Shop. Desc: Pet the image of a Gorgon, one of the boss led by a legion of darkness. There is no danger, it is possible promenade with confidence. I can get with a coin shop in Halcon patron warfare in the waiting room --> The chibi version of Gorgon, one of the monsters led by a legion of darkness. 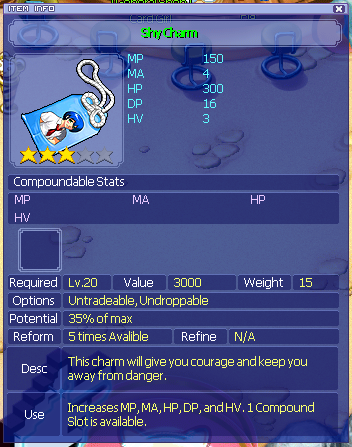 Obtainable from exchanging Gorgon shards and the set with Stella in Megalopolis Shop. Desc: Pets reflecting the image of the disk Caribbean, one of the boss led by a legion of darkness. There is no danger, it is possible promenade with confidence. I can get with a coin shop in Halcon patron warfare in the waiting room --> The chibi version of Charybdis, one of the monsters led by a legion of darkness. Obtainable from exchanging Charybdis shards and the set with Stella in Megalopolis Shop. Desc: Pets reflecting the image of the Kronos boss led by a legion of darkness. There is no danger, it is possible promenade with confidence. --> The chibi version of Chronos, led by a legion of darkness. 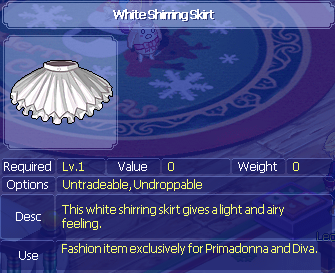 Obtainable from exchanging the Ultimate Amadas set with Stella in Megalopolis Shop. Desc: Pet the image of Scylla, one of the boss led by a legion of darkness. There is no danger, it is possible promenade with confidence. I can get with a coin shop in Halcon patron warfare in the waiting room --> The chibi version of Scylla, one of the monsters led by a legion of darkness. Obtainable from exchanging Scylla shards and the set with Stella in Megalopolis Shop. Desc: Pet the image of Ganymede, one of the boss led by a legion of darkness. There is no danger, it is possible promenade with confidence. I can get with a coin shop in Halcon patron warfare in the waiting room --> The chibi version of Ganymede, one of the monsters led by a legion of darkness. Obtainable from exchanging shards with Stella in Megalopolis Shop. Desc: Pet the image of a Cyclops, one of the boss led by a legion of darkness. There is no danger, it is possible with promenade with confidence. I can get with a coin shop in Halcon patron warfare in the waiting room --> The chibi version of Cyclops, one of the monsters led by a legion of darkness. Obtainable from exchanging shards with Stella in Megalopolis Shop. Desc: Pets that have created in the motif Hanyu --> Pet that resembles Hanyu from Higurashi no Naku Koro Ni. Use: Hanyu fan recommended limited pet --> Pet recommended for Hanyu fans. CWB Boxes! 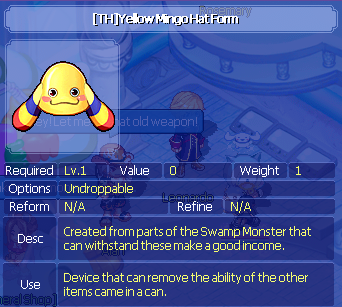 I think there should also be the [TH]Mingo set included. There is no link, so I'm hoping a picture of them helps. I can't find the individual item White Shirring Skirt in webshop. I've looked in bottoms and I couldn't find it, however it is available in In-Game Myshop. Please add White Shirring Skirt [x] to webshop, thank you.